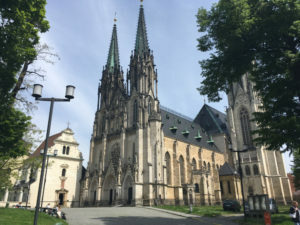 Don`s main goal was to visit the Czech UNESCO monuments and there is no better starting point in the Czech Republic for these day trips than Brno. He had recognized it soon and had preferred Brno before Prague for his stay. I was very lucky that during his searching he came across to my agency and had contacted me with a request for 3 days trip to UNESCO monuments. We together set up plan to cover as many monuments as we could within 3 days and so achieve his 500th visit of the UNESCO monument. Our meeting point was the Dominican square were we met every day at 0900 AM which I suggested based on the location of Don`s hotel. It was Sunday, there was no traffic and we were very lucky on the weather too. 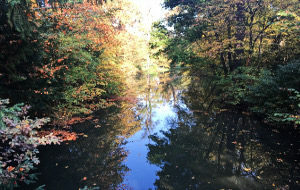 Second wave of Indian summer had arrived and days were quite warm and sunny which enabled us to make beautiful pictures. Our first steps lead us to 80km distant Žďár nad Sázavou town where is located the UNESCO monument of the Pilgrimage Church of St John of Nepomuk at Zelená Hora. After introducing a brief history about the Czech patron John of Nepomouk whom is the church consecrated and visiting its premises, we continued to our next destination Litomyšl town. Roads lead as through beautiful autumn colorful nature and offered us breathtaking scenery views. We felt we had found ourselves in a fairyland. Upon our arrival to Litomyšl town we went for a lunch first. 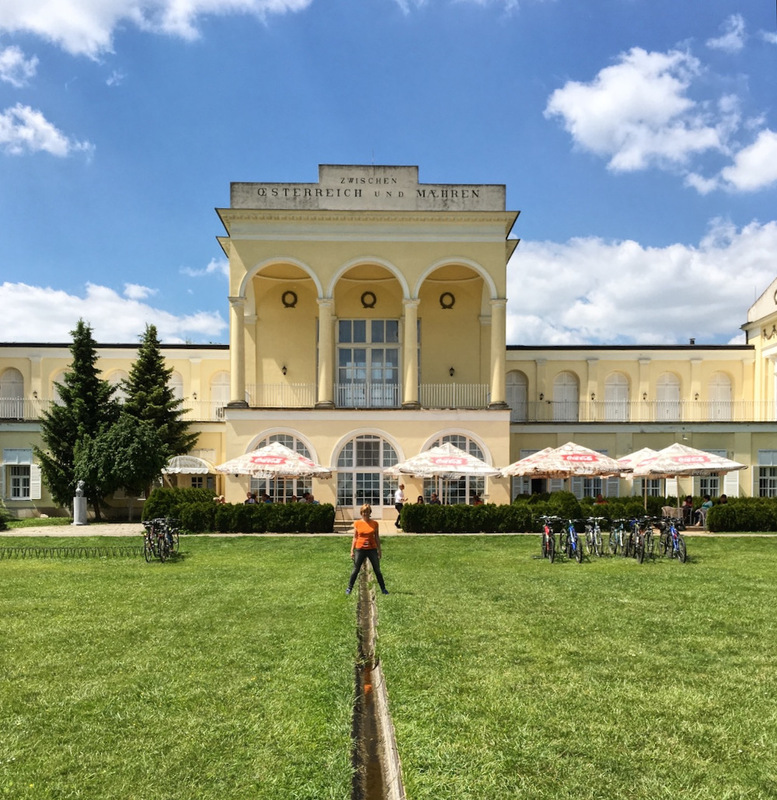 Because of the weather we sat outside on the terrace and soaked up the athmospehere of the historical Litomyšl where the Czech inteligence concentrated around the printing house in the course of the 19th century. Litomyšl is a birth place to many famous Czech personalities from cultural and political life and one of them is the Czech composer Bedřich Smetana. I am sure that you have heard at least once the Moldau symphonic poem. After the lunch we walked to the castle area which is situated on the so called Mount of Olives. Though, the castle was built in the course of the 16th century, the area has a rich history starting from the 11th century. The predecessors of today castles was the monastery building, later converted to Bishop residence and the residence of the first lords. 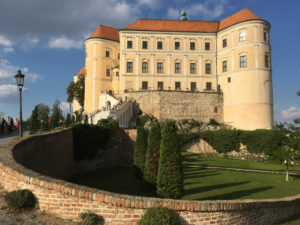 The castle was built on the order of the new owner Vratislav of Pernštejn (the Supreme Chancellor of the Bohemian Kingdom) for him and his wife who came from the famous Spanish noble house Mendoza. She gave birth to 20 children. Obviously they needed a huge castle to live in 🙂 The whole castle area was built in the Renaissance era. The castle sgraffito decoration on the facade is the only which survived from the original Renaissance castle. Thousands of sgraffiti with unique figural, vegetal, zoomorphic or ornamental motifs represent an individual work of art of extraordinary invention. Unfortunately, because of many fires the original Renaissance interiors have been lost for good. On a tour in the castle interiors you will see interiors from the 18th century. However, there is one treasure which survived the fire, although it is not from the Renaissance time. 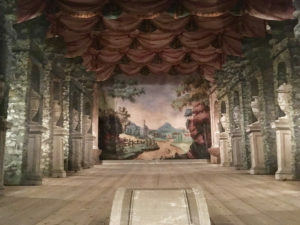 It is a castle theatre, one of very few original theatres which survived in Europe. The original theatre´s two curtains and the 16 surviving backcloths, together with the scene-shifting mechanism is why the theatre is so unique. 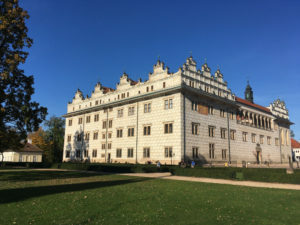 After touring the castle, Don desired to visit a birth house of Bedřich Smetana located in the castle area in the building of the former castle Brewery. The father of Bedřich Smetana was beer brewer. Visiting the exposition includes personal belongings of Bedřish. 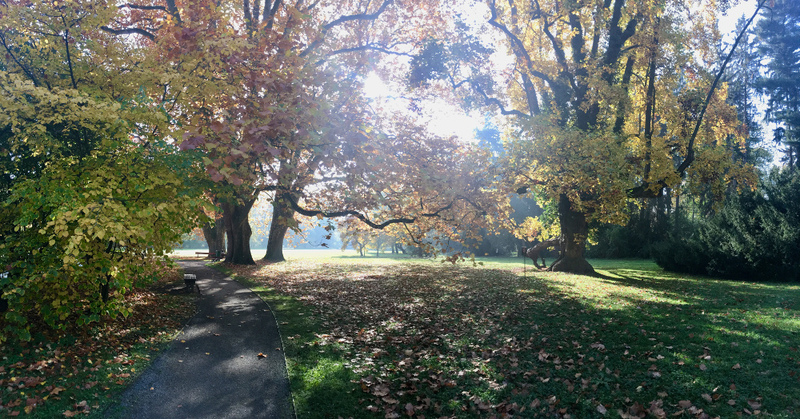 Before heading back to Brno we walked in the Monastery gardens which were transformed to the park in 2000. 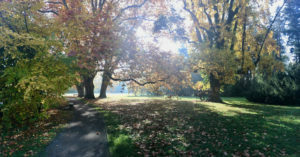 The gardens are surrounded by two churches and offer very pleasant place to enjoy the atmopshere of the town which was declared once a Spa town of Spirit. Out last steps lead as via Smetana square surrounded by burgher houses where on many of them you can see memorial plaques informing tourists what important person of the Czech cultural, political or scientic life was born here or who resided there for a while. Many personalities were Czech writers of the 19th century such as Božena Němcová or Alois Jirásek. My favourite day trip. 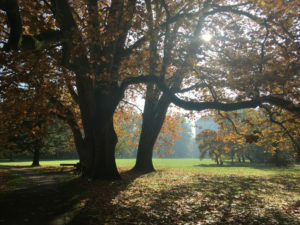 It was Monday, another lovely autumn sunny day. Who has visited Europe before, knows that Monday is not very tourist friendly day since many monuments are closed to public. However, this fact brought us many advantages. We reached our first stop Lednice town around 10:00. 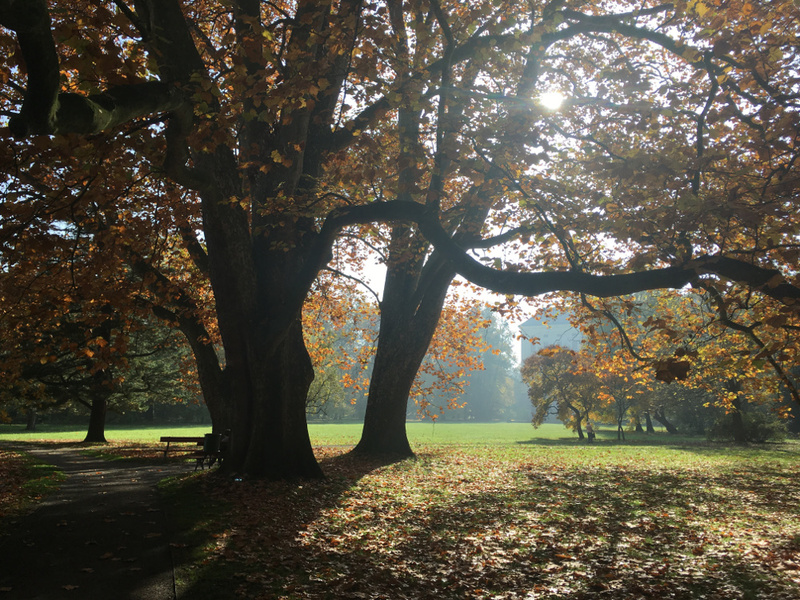 After introducing a brief history about the whole Lednice-Valtice 161 km2 area which belonged for several centuries to the famous Europe family of Liechtenstein we took a walk in the castle park. Started from Lednice chateau, heading to the Minaret and back via the other way, it took us around 40 minutes. Our next stop was 7 km distant Valtice town, the former main residence of the princely house of Liechtenstein. On our way to Valtice we made 2 short stops to see interesting buildings which spread across the whole area since the beginning of the 19th century. The horseshoe shaped colonnade, a popular cyslist stop, built in the ancient Greek architectural style, named after 3 ancient graces standing on the plynth in front of the colonnade. The chateau gained its name after its location on the former border line between Moravia and Austria. When the Czechoslovakia was established in 1918, the border line moved towards to the south and Hlohovec town together with Valtice town which originaly had belonged to Austria, became the part of the Czechoslovakia, today the Czech Republic. In Valtice town we intended to visit the National Wine Saloon of the Czech Republic found in the chateau cellars from the 14 the century. The exhibition provides visitors many options to sample the best Czech wines, the winners of the competition held in Valtice every year on May. 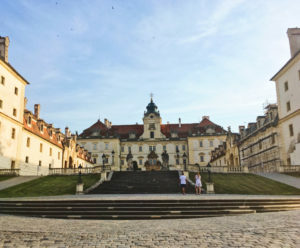 Due to location of the National Wine Sallon, Winery School, the Museum of Wine making and the fact that the Valtice is venue for the biggest wine competition in the Czech Republic, Valtice is rightfully called the Capital of the Czech Wine. Unfortunately, it was a mid-season and the Saloon was closed together with the castle on Monday. But we were not disappointed. We decided to see the most famed structure of the Liechtenstein holdings. 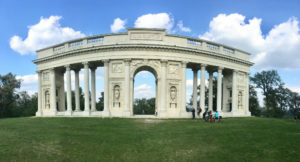 The Colonnade designed by Joseph Hardtmuth, inventor of the graphite pencil and the designer of many structures found in Lednice-Valtice area. 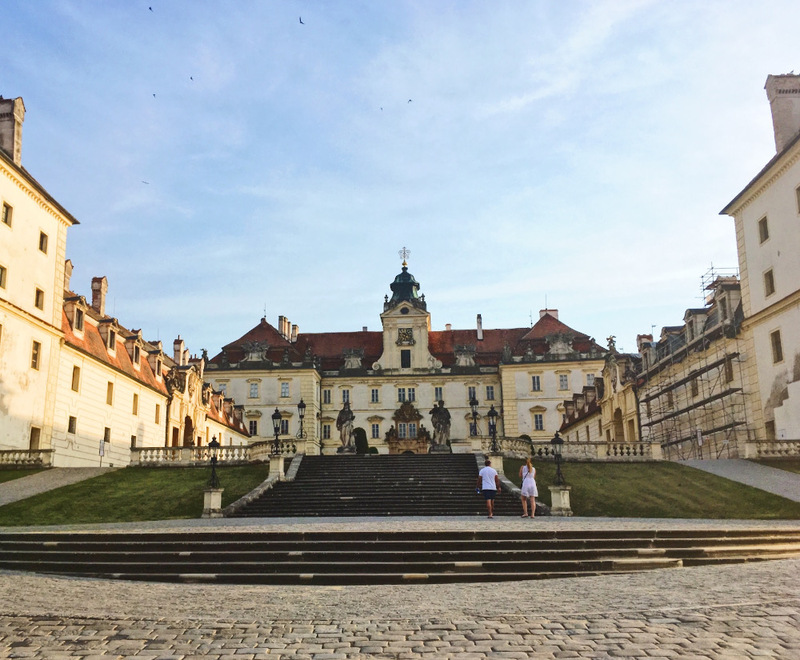 Our last stop on this day trip was my most favourite town in Moravia, Mikulov. I think it is the most picturesque town in Moravia. 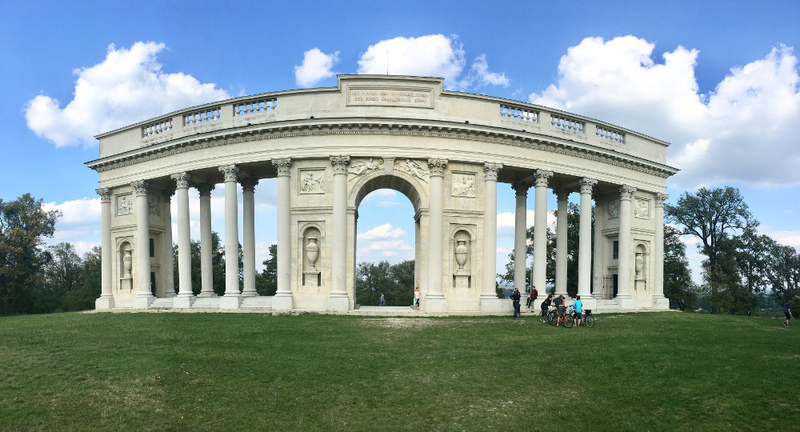 While inspiration for Lednice-Valtice area was taken from ideas of English naturally composed free landscape parks, here in Mikulov the inspiration was obviously taken from the Italian Renaissance later Baroque. 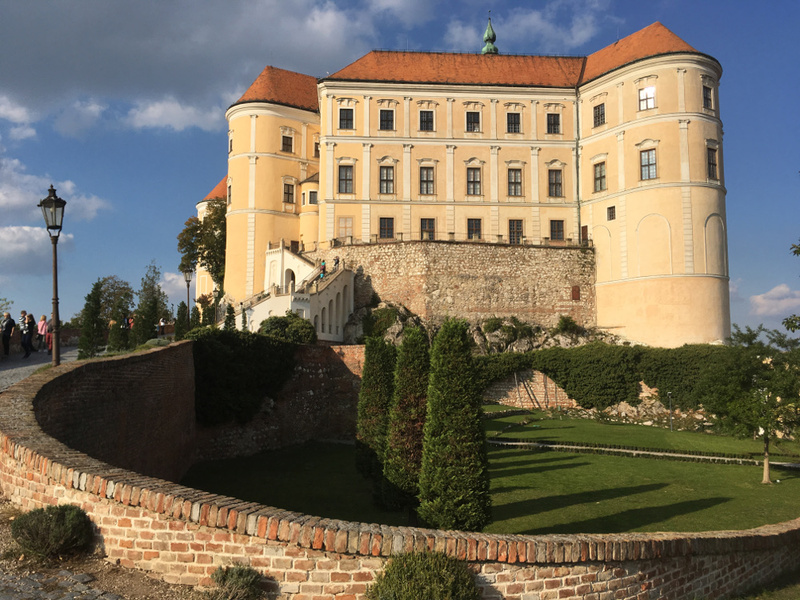 When walking in the town around the castle I found a good restaurant for lunch located in the former Jewish ghetto which was once the most important ghetto for Jewish people in Moravia. 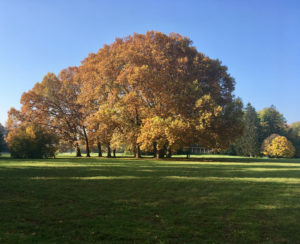 It was the main seat of the Moravian Land Rabbi. The legacy of the Jewish residents is still seen on the buildings of their former houses and in the cemetery which is a Jewish pilgrimage site. We returned to Brno around 4 PM. But we had not finished yet. 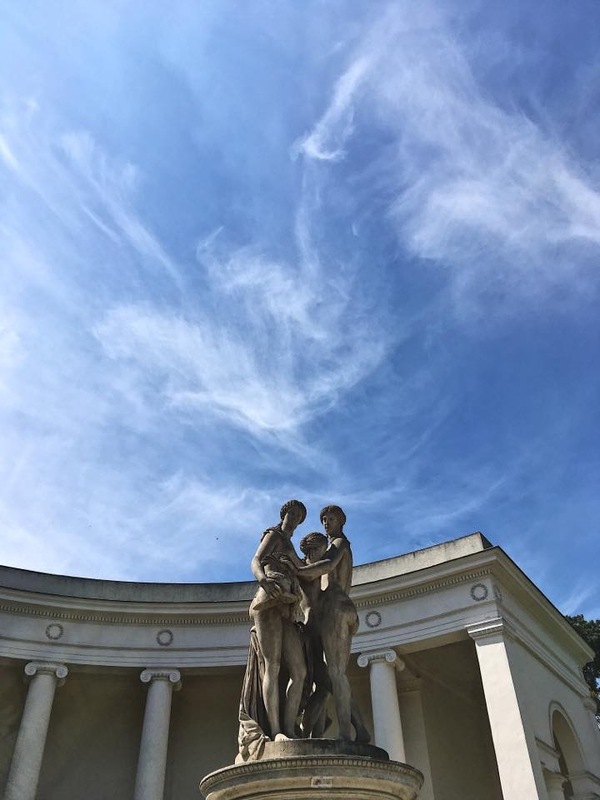 Don`s desire was to visit the UNESCO Vila Tugendhat in Brno. Unfortunately, to visit vila you need to book tickets 3-4 months in advance. Tours were already sold out. But we were lucky. I found on the internet an ongoing event in Vila, it was a concert of the classic music and they still had tickets available. I proposed this option to Don and he was very happy and accepted it. The concert started at 07:30 PM and lasted for about 1 hour. Vila has its very unique atmosphere because of its history and history of its owners and because of its timeless design and to experience this atmoshpere in the evening when listenting to music, is an unforgettable experience I had had dersired for a long time. Morning autumn dense fog. This is what we saw when driving to Kroměříž town. The weather had not improved when we arrived to Kroměříž and we could not have seen much of the Kroměříž gardens. We decided to postopne this visit and continue to Olomouc town first. Another 40 min driving and the weather slowly got better. It was cloudy but no rainy and nothing prevented us from walking in the Olomouc historic city centre. Starting from Dom Hillock where the St Wenceslaus cathedral and the old Romanesque castle are situated we learned about the beginning of Olomouc which is dating to early 9th century. Our next stop was the Archbishop Palace, the seat of Olomouc Archbishop, which was the place where many important historic events happened. Aproaching the Náměstí Republiky square we saw the Triton fountain the first of 6 original baroque fountains placed in Olomouc city centre. Walking to St Michael Hillock we passed by the Jesuit church and the buildings of the Palacký University, the second oldest university in the Czech Republic founded by Jesuit order in the 16th century and the impressive St John Sarkander chapel built on the place of the former prison where John Sarkander was tortured to death in 1620 and later in 1995 canonized. On the St Michale Hillock is situated one of the most beautiful Baroque churches in Moravia. 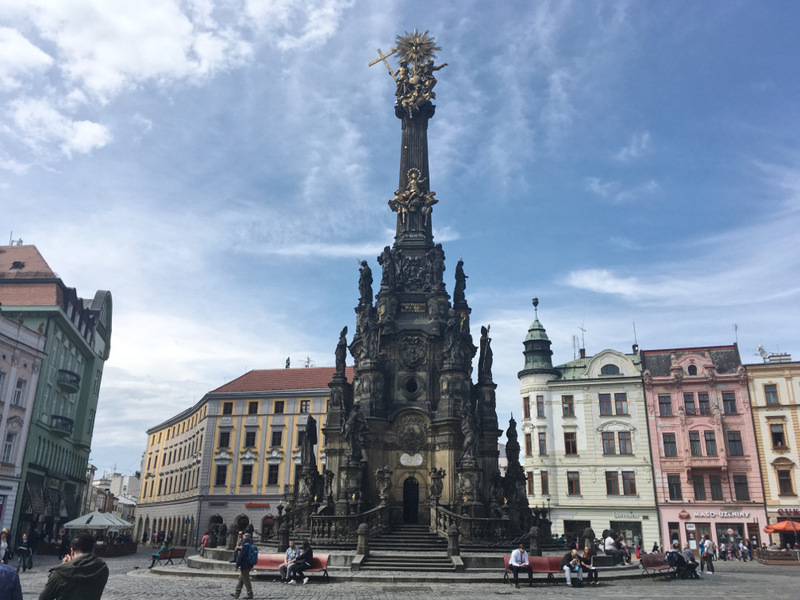 We descended to the Lower square where we admired another two Baroque fountains and the Marian Column when we finally saw the reason why we had included Olomouc city to our list to visit. The impressive UNESCO monument of the Baroque Holy Trinity Column, which dominates the city center and the view on it is breathtaking. It is the largest group of Baroque statues within a single sculptural monument in Central Europe. The column reaches a height of 35 metres and its lower part houses a seasonally accessible chapel. Walking back to the parked car we made another visit of the very interesting St Moric church which is by its appearance one of the most remarklable gothic churches in Moravia. 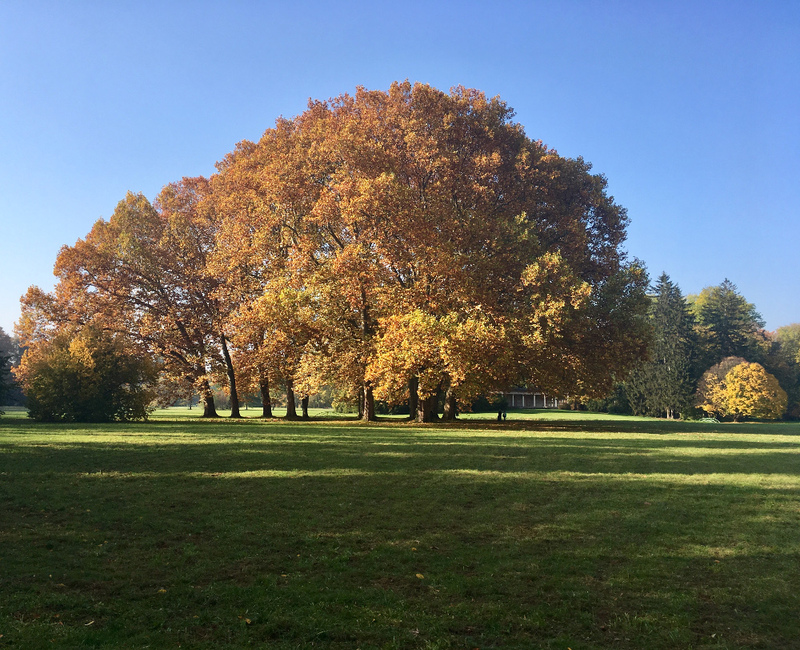 The fog was finally away and we could have made the visit of Kroměříž gardens which are together with the Archbishop Palace listed on the UNESCO World Heritage. Starting from the main square I introduced Don the early history of Kroměříž town and took him throughout the centuries until 1945. He learned that Kroměříž was in the possession of Olomouc Bishops and later Archbishops and that the town was their summer residence. After walking in castle gardens, which is today 64 large English style park, we drove to the Flower garden, the reason why Kroměříž was inscribed on the UNESCO list. The Flower garden represents a masterpiece of European garden art of the 17th century. It is a turning point between Italian Renaissance gardens and French gardens in Baroque-Classicist style such as, for example, Versailles. Today, the Flower Garden is virtually the only example of this type of composed complex in Europe. Full of impressions and of new knowledge we shared to each other during these 3 days we returned to Brno and said goodbye. What would be the the next stop of the traveler who has visited every country in the world? It would the country which does not officialy exisit, the Liberland, Don`s next destination to explore. Please, how much that 3 days trip to the World Heritage sites would cost me? Car plus driver. We are two people and will be in Europe the first week of decemeber. Thank you. There are listed all 3 day trips I did with Don. 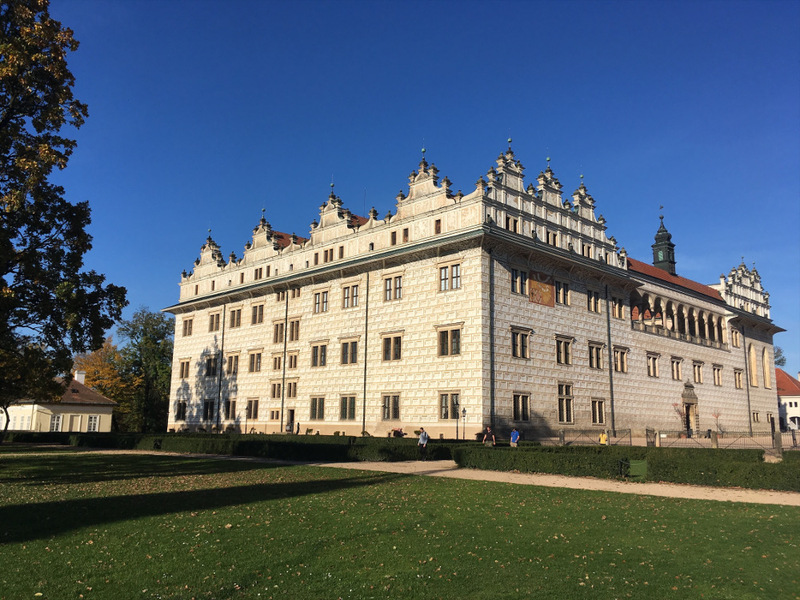 Please note that in December Litomysl castle and St John Nepomuk church are closed. these trips are outdoor throughout the year so we would not be limited with opening hours. I do not know time you arrive to Brno yet but if it is at the beginning of December I would like to recommend you a great event held on December 2, which is Re-enactment of the Battle of Austerlitz.